Some 22 of the Ghanaian judges allegedly caught on camera asking for bribes have been shown the videos at the start of the investigation, judicial sources have told the BBC. The hearing has been held behind closed doors at the Supreme Court; the judges' responses have not been made public. A total of 34 judges and magistrates have been accused after a two-year investigation by a local journalist. 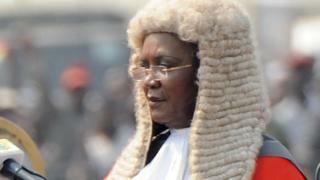 It is the biggest scandal in the history of Ghana's judiciary. The BBC's Sammy Darko reports from Accra that a total of 180 court officials are facing dismissal procedures, in a case that has gripped the attention of Ghanaians. The 22 lower court judges and magistrates have been suspended pending the investigation. The 12 accused High Court judges have until Monday to submit their written responses to the accusations. Chief Justice Georgina Theodora Wood will then examine their responses before deciding whether to open a formal investigation into the accusations, in which case, they would also be suspended, our correspondent says. He says each of the accused judges has only been shown the portions concerning them. The accused judges attended the hearings accompanied by their lawyers. Investigative journalist Anas Aremeyaw Anas says he has nearly 500 hours of video evidence on tape, which had been handed over to the chief justice. The attorney-general has granted him immunity under the whistle-blower act to pursue the story. Our correspondent says the issue now is whether Mr Anas should go ahead and broadcast the video as he has said he will. Some fear showing it will gravely undermine the authority of the court, he says.